In running an AmeriCorps program for 15 years, Deidre Crawley faced many challenges, the greatest of which was a drastic cut to AmeriCorps programs in 2009. Deidre shares how they came through that difficult period as well as lessons in young adults supervising other young adults, and managing your own emotions and reactions at work when in a leadership position. 00:07 ANNOUNCER: This is Do Good, Be Good, the show about helpful people and the challenges they face in trying to do good. Your host is Sharon Tewksbury-Bloom, a career do-gooder who also loves craft beer and a good hard tackle in rugby. Sharon speaks to everyday people about why they do good, and what it means to be good. 00:27 SHARON: Happy AmeriCorps week everyone. 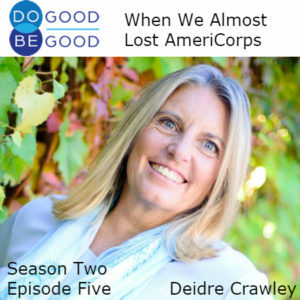 I’m your host, Sharon Tewksbury-Bloom, and if you’ve been listening to any of the episodes yet in season two of Do Good, Be Good, you know that we have been highlighting stories of people serving in AmeriCorps. I served in AmeriCorps in 2007, and I also served as a Program Director for AmeriCorps programs in Flagstaff, Arizona, for five years. Today’s podcast is brought to you by the Do Good, Be Good AmeriCorps Training Series, more on that later. My guest today, is Deidre Crawley. Deidre was the director of the AmeriCorps program that I served in in 2007. Five years later after I served, she hired me as the program coordinator for that same program. And I loved working for Deidre. I consider her a mentor, and now I’m very grateful to count her as a friend. Deidre left the AmeriCorps program a few years ago to take a position as the Dean of Flagstaff Arts and Leadership Academy, which is a public charter high school here in Flagstaff. We refer to it as FALA in this interview. Deidre and I started the interview by talking about how one of the ways she is helpful, is as someone who is willing to stand up for others and fight for them if necessary. 02:53 SHARON: I asked Deidre, about a challenge she faced leading AmeriCorps programs in Flagstaff, Arizona. AmeriCorps is a federally-funded program. AmeriCorps members commit to serving in schools and non-profits, usually for one year. While they’re serving they earn a small living stipend. At the end of their service, they’re awarded an educational voucher that they can use at any point in the next seven years for higher education or to pay off a student loan. 03:23 DEIDRE: It was my third year in, I had written a grant that didn’t have any exceptions to it. I had a team of 15 people. We were a well-oiled team and everybody was functioning really well. We had probably one of the most amazing recruitment seasons. We were recruiting for a 120 members. Things were just probably better than they ever, ever could have been. And two weeks later we were told that AmeriCorps might be shutting down. What was going on was actually a good business practice. But when you have federal dollars you can’t use… You can’t obligate federal dollars for something else, if they’re obligated for a particular piece. So there was a trust for AmeriCorps members, educational vouchers that they could use. The overseers of that knew and truly so that those would… Not everyone in AmeriCorps would use their voucher all at the same time. So they were able to provide more services using that as a back-up funding source. What the federal government said was that money is earmarked for trust and you have to keep it as if everybody’s gonna use it all at once. When that happened, we went from a program of a 120 that we were recruiting for, to 23. 05:00 DEIDRE: And we had to be in a freeze for three months. With not knowing if it was even gonna come back. With the understanding that how we were going to manage AmeriCorps was gonna completely change forever. That meant also that I had a staff of 15 that I had to figure out what we were gonna do, how are we gonna do this, where are we gonna go. And 120 members out there, who were wanting to be in AmeriCorps had already been placed. Everything was already ready to go. For about a month we couldn’t even tell them yes or no. That was hard. We were literally riding high, it was like we had a great team. We had recruited for every spot, for 120 people who were gonna come in and give back to the community. 05:57 DEIDRE: And the other piece of that was… It was only gonna… The… Our sites, who didn’t have that much money, only had to pay a dollar an hour. Probably 75% were being placed in schools. The price that was gonna have to be paid in order to make that up was gonna have to go up significantly, and schools couldn’t do it. And so, that was the first cut that had to happen, was that all of these enthusiastic, wonderful, giving people who were excited to give back to their community and through the schools and help kids, weren’t gonna be able to do that. All of that was heart breaking. It was one of those things that from this point forward, I’m like, “We don’t know.” Until you’re there and you’re doing it and it happens, then you know it’s happening. So there was never this guarantee that you were gonna get this and that was a huge lesson in leadership, and I had to let staff go. 07:02 DEIDRE: The first piece was the first letter that had to go out immediately and we did a phone tree so we didn’t want it just to be the letter that let people know. So the first piece was… There was a lot of work to do so we needed the staff to do that, was a phone tree of letting… “This is happening. Everything’s on hold, we’ll keep you posted.” These are the reasons why, again, being very transparent about every piece along the way about why we got to where we are today. The staff, I think, because many of them were former AmeriCorps members so they had that, “I wanna give back.” So they were willing to do what it took even when they knew that we were cutting back. Everybody who was in that was in a place of, “We’ll do whatever it takes to make this work,” with the understanding that some of us may have to be looking for another job right now. The same thing with the members. I think that it was the most difficult for the schools because now they were gonna have to change how they worked with the students. And usually they were in the programs of the students with the highest needs. The tutoring programs was the biggest thing that we were doing. 10:24 SHARON: I think it’s really hard too, to not make it about you. 10:29 SHARON: Especially when it’s affecting you. 10:31 SHARON: It might be your job, that’s going away or it’s the work that you do, you have so much of you in it, and then it’s… You’re having to tell other people how it’s affecting them and to not have that piece of it where you want them to say, “Oh you’re gonna be okay.” Or you want them to care about what it means to you or how it’s affecting you. Yeah. 10:53 DEIDRE: And as we started in the beginning, I’m a rescuer, [chuckle] and I want to make everybody okay and happy, so that’s hard for someone who has to share difficult news and who wants to protect all of the people. 11:11 SHARON: Season two of Do Good, Be good is sponsored by the AmeriCorps webinar series. Do you work with an AmeriCorps program? Then I would love to work with you. I can design and deliver customized webinars for AmeriCorps supervisors and members. Contact me at connect@sharonspeaks.com for more information, that’s connect@sharonspeaks.com. Mention this podcast for a 20% discount. Now back to our show. 11:42 SHARON: When I was in AmeriCorps, Deidre led a workshop that I attended called ‘Friend Trap.’ I found it very helpful and I asked her to share how she developed it. 13:04 DEIDRE: And it was very difficult for that supervisor to have to be the one to report something that was happening with a young person that had to be reported. And as a mandated reporter, it’s a very difficult thing to have to deal with. It doesn’t feel comfortable. You know that there’s gonna be some sort of trouble along the way, but it has to be done. And the young person that had shared the confidential information was very angry and said, “I told you that as my friend. I said you couldn’t tell anybody.” And so that was a very important situation where both of them learned a lesson about what you share, and why you share certain things with certain people, and why you don’t. But when you’re in a position of leadership over other people, you have to be careful, to have a little bit of a boundary. You can still be friendly. You can still do things, but you have to make it very clear that there is a boundary. It’s hard. 14:04 SHARON: I asked Deidre if she had any recent stories about her new role as the Dean of a Public Charter High School. 14:10 DEIDRE: We’ve been waiting for a really long time for snow in Flagstaff. So yesterday, we got snow in Flagstaff. The excitement at our school was palpable. Everybody was like a little kid. At lunchtime, a snowball fight ensued. And this was perfect snow conditions for a snowball fight. I mean, it was wet, it was icy, and you could make some lethal snowballs really fast. But I’m in a position of safety for the kids, so I can’t exactly join in on this. And so I’d come out and said, “Don’t throw any snowballs.” But there was still some snowball throwing going on. And then a couple of teachers said, “You need to do something about all the snowball throwing.” So I got on the intercom, and I was pretty excited at that moment. And I said, “At FALA, we don’t throw snowballs. And if I catch anybody throwing snowballs, you will be punished.” [chuckle] My advice to you is before you get on an intercom, know where you’re going. Don’t be too excited about it. 15:23 DEIDRE: Now the joke at FALA is, “You don’t wanna be punished.” [chuckle] But it was a good moment. It was fun. And then I found out that it was a teacher who started it all. One of the things that I do there is I have students write apology letters when they have done something that is worthy of an apology. And so the teacher came in and I said, “So I understand because many teachers have told me, and told on you that you were the one that started it.” And he looked at me, and he said, “I’m so sorry.” And I said, “So what are we gonna do about it?” And he said, “Write an apology letter?” [chuckle] So I got an apology letter today, and it really made my day. It was really, really sweet. He said it would never happen again. 16:09 SHARON: Deidre also shared a story about when she had something to apologize for. 19:08 SHARON: Before she left, I asked Deidre what she thinks it means to be good. 19:12 DEIDRE: To be able to be in a position to have a passion for something and understand that in that passion you’re being able to give back for the greater good. 19:29 SHARON: Well, that’s a wrap. Thank you for listening to Do Good, Be Good. And happy AmeriCorps week. If you wanna learn more about AmeriCorps, visit americorps.gov. For show notes on all of our episodes, visit dogoodbegoodshow.com. If you want more behind the scenes stories and insights about our podcast, then check out our show page on Facebook at facebook.com/dogoodbegoodshow. Thank you so much to Deidre Crawley for coming into the studio and sharing her story. This podcast was produced with help from Sun Sounds of Arizona. Music in this episode is Bathed in Fine Dust by Andy G. Cohen, released under a Creative Commons attribution international license and discovered in the free music archive. Until next week, this is Sharon Tewksbury-Bloom signing off.